Flies are a group of winged insects that include many common pests. Houseflies, mosquitoes, and gnats are all examples of flies. Domestic flies are those commonly found around homes and businesses. Flies may carry disease or just be annoying. 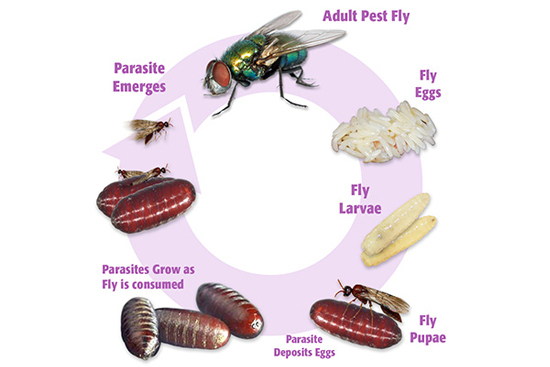 Domestic flies all have a similar life cycle. There are four stages of growth -egg, larva (or maggot), pupa, and adult. 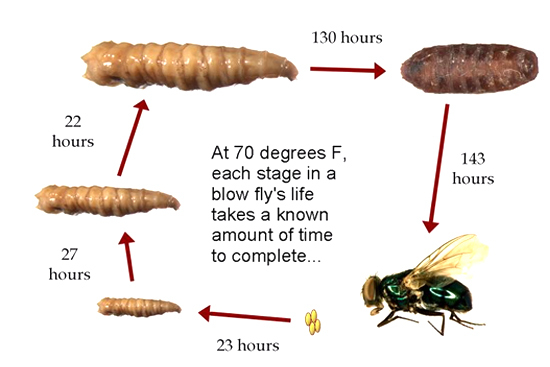 Depending upon the type of fly, it may take about one to four weeks for the cycle to be completed. Eggs are laid by the female fly onto breeding material, usually dead animal or vegetable material. Most flies prefer the breeding material to be moist, but not liquid. Eggs can hatch very quickly, about 12 hours, after being laid. The larva is a small, white or cream colored, worm-like stage that hatches from the egg. The larva burrows into the breeding material where it feeds and grows for several days. Usually, the larva leaves the breeding material and moves to a dry, protected place just before becoming a pupa. the pupa is an inactive stage, like a cocoon, in which the adult fly develops. After leaving the pupal case, adult flies mate and the females begin to lay eggs. Adult flies may live for several weeks. There are three types of domestic flies commonly found around homes and businesses - houseflies, bottle or blowflies, and flesh flies. Houseflies are grey and black with four black stripes on the back. They are about 1/4 inch long. Eggs are laid on decomposing organic matter, either plant or animal. Female houseflies lay, eggs in batches of 50-100, and as many as 500 eggs may be laid in a lifetime. Depending upon the temperature, it may take as little as 10 days from egg to adult.